I just want to drop you a line to say thank you very much for your in-kind support of Business Swap’s Stress Down Breakfast on 24th July 2008 and for providing such an entertaining and inspirational presentation. The breakfast was a fabulous start to Stress Down On 24/7 and it was great to see everybody having such a thoroughly relaxing and fun time. Lifeline very much appreciates your support of its inaugural national fundraising campaign and in particular for Lifeline Gold Coast, we very much appreciate the support of Business Swap members and their guests on a local level. 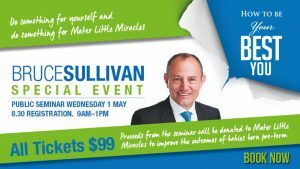 It is currently too early to announce the final results from the national fundraising campaign however the Business Swap Breakfast raised $1800, which is a tremendous result. What we do know however is that the event generated plenty of promotional opportunities via the media, which has provided us with a great platform to build on for next year’s Street Down on 24/7. Once again, thank you very much for really setting the scene for the Stress Down Day on the Gold Coast. I do hope Lifeline has the pleasure of working with you in the future.